We already know forex is a market with about 5 trillion daily turnover. No doubt, forex is a huge market. 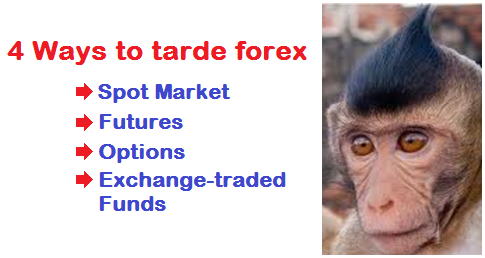 FOREX market has 4 instruments, in other words currency can be traded in 4 ways. Here I am only talking about the most popular instruments of FOREX. Spot Market: This instrument is traded on the spot at current market price. In spot market, currencies are traded around-the-clock. Spot market is attractive because of its simplicity, liquidity and tight spread. In this market anyone can easily participate investing as little as 1 dollar. A huge numbers of brokers are available to serve the traders. The brokers supply trading platform, price chart, trading tools and fund management. Futures: Future refers to the contracts to buy or sell any asset at a certain price on a future date. This instrument is standardized,well regulated and traded through a centralized regulatory body.According to the wikipedia.com "a futures contract (more colloquially, futures) is a standardized contract between two parties to buy or sell a specified asset of standardized quantity and quality for a price agreed upon today (the futures price) with delivery and payment occurring at a specified future date, the delivery date." Options: According to the wikipedia.com "an option is a contract which gives the buyer (the owner) the right, but not the obligation, to buy or sell an underlying asset or instrument at a specified strike price on or before a specified date." Exchange-traded Fund(ETF): According to wikipedia.com "An exchange-traded fund (ETF) is an investment fund traded on stock exchanges, much like stocks.An ETF holds assets such as stocks, commodities, or bonds, and trades close to its net asset value over the course of the trading day." Currencies are traded on the spot in spot market. Future contract cannot be quit before the specified date. Options can be quit before the specified date. EFT is a special form of fund that is traded like shares and bonds. Dear Traders, If you have any question, you can drop a comment below. Forex trading is trading currencies from different countries against each other. Forex is acronym of Foreign Exchange.